Some of the braver cyclists will continue pedalling through the winter months and who can blame them? It’s a fun passion, it’s great exercise and it’s a cheap way to commute to and from work. There are risks to look out for when cycling in winter, thanks to the shorter days and gloomier weather, so it’s important to take the right precautions. 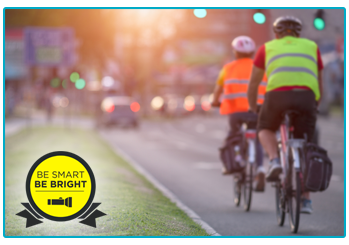 For example, it’s worth wearing bright and reflective clothes to make it easier for other road users to spot you. 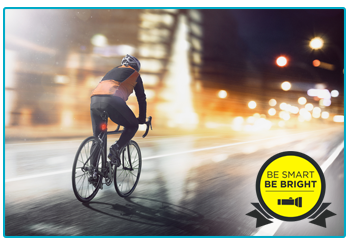 To raise awareness of how to stay safe in winter when enjoying such passions as cycling, we’ve launched our Be Smart, Be Bright campaign. We also thought we’d impart a few ways you can avoid getting into difficulty when riding in during the colder, darker months in our bike safety blog! One of the most important things you need to do to be smart and bright during winter is to put lights on your bike. It is compulsory to have a white light on the front of your bike and a red light on the back when cycling on a public road in the dark – and in winter, cycling in the dark becomes harder to avoid! Lights also help you see where you’re going when cycling along unlit roads and they can make it easier for other road users to spot you. Before going out on your bike, make sure your lights are fully charged. If they are battery-powered, check their batteries are still working. It’s so easy to get caught out without working lights! Some cyclists even prefer to have their lights on constantly in winter, when the persistent gloomy weather can restrict visibility and lights could help resolve this. As well as lights, it is also compulsory to have certain reflectors on your bike if cycling after dark. You need to have amber reflectors on the front and back of your pedals if your bike was made after October 1st 1985, as well as a red reflector on the rear of your cycle. Though not mandatory, it is also good to have reflectors on the spokes of your wheels and a white one on the front of your bike, as these help other road users to spot you when it’s dark or overcast. You should not have triangular red reflectors attached to the back of your bike, however, as these are supposed to be attached to trailers only and you could confuse other road users when visibility is poor. When it’s dark or gloomy, your clothes can help you to be seen. Wearing fluorescent and reflective gear makes it much easier for road users to spot you, so it’s worth losing style points for! Fluorescent colours work well during the day because they react with the sun’s light and appear to glow – and yes, even though Britain rarely gets any sun, they do work here! After dark however, they won’t work so well. Reflective clothing is your best bet at night because it shines when under artificial lights, such as street lights or car headlights. If you’re wearing a backpack, it’s worth putting reflective stickers on there as well. If you commute by bike, you’ll almost certainly be travelling in the dark at this time of year, so reflective clothes and accessories are worthwhile. Aside from the dark, there is one particular weather-related hazard that often crops up in winter: ice. If you intend to brave a bike ride on potentially icy roads, then it’s important to prepare well. Often, ice tends to form at the sides of the roads, where people usually cycle, so ride a bit further away from the kerb to avoid sliding around. Leave a bit of distance between yourself and any cyclists in front to avoid crashing into them if they end up skidding on ice. Try to avoid routes that you know could be icy, such as country roads or cycle paths, so that your ride is a bit less sketchy. If you do get caught out by some ice, try not to yank the brakes on or swerve as braking and quickly turning is likely to cause you to slide. Consider changing things on your bike, such as tyres and pedals, to make your bike more winter-ready. If you usually race around on a road bike with skinny tyres, you might struggle a bit on the ice! 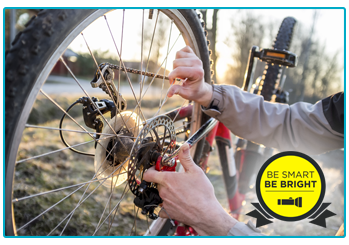 Swap your tyres for the widest pair you can get on your wheels and pump them up to a low pressure. If you usually ride with clipless pedals, it could be worth switching to flat ones so that you can put your foot down more easily if you need to. However, some people might argue that clipless pedals give them more control, which can help them balance better when riding over ice. It’s potentially worth putting mudguards on your bike too – not so much for safety but to to save you from getting mud or water up your back and on other cyclists too! As long as you know the potential problems that come with cycling in winter and you know how to deal with them, then it can be fun to continue riding through the colder months. Nevertheless, these hazards can still catch you out, so insurance could be helpful. Our policies include cover for Theft, Accidental Loss Or Damage as Standard and you can also choose such Elective Benefits as cover for Cycling Clothes up to £500. If this is something you’d be interested in, stop by The Insurance Emporium today!